This is one of the most popular articles I’ve posted on the Herbs and Oils Hub website. It’s a recipe by Danielle (Poor and Gluten Free) for her Grandmother’s cucumber dill pickles. It’s a brine recipe with garlic, dill and some other ingredients. Nice, simple directions. 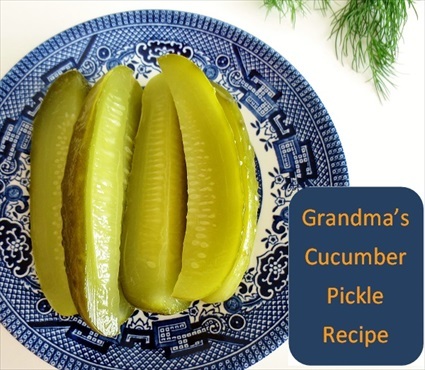 Click on the Grandma’s Cucumber Dill Pickle Recipe link below to see the complete recipe. where is recipe? it doesn’t show here.. too many ads choice all over the pages. No recipe 🙁 keep sent me off to another page to the ads so give up and wish there was a recipe easy to find. Hi Kat. Just go toward the bottom of the post and look for “Grandma’s Cucumber Dill Pickle Recipe” Click on that link and you’ll see the recipe.